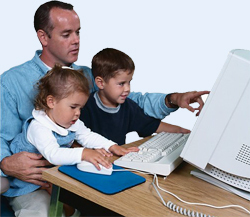 Do you have small children or teenagers that you would like to control what they have access to on your home pc, laptop or Ipod® Touch? Then we have the solution for you...Try our whole home family filtering system that is guaranteed to prevent unauthorized content from being viewed by young innocent eyes. For a monthly fee we will protect the content that is able to be viewed in your home. What can the Family Home Filter protect you from? This will block most attempts at malicious websites that try to inject viruses through unsuspecting websites. Our service levels are tailored to your needs and best of all it can be canceled at any time. No contracts or obligations to worry about. All content is able to be customized to your needs. All packages can have a detailed report emailed to you so that you can monitor what your child has been viewing or has attempted to view.